Dr. Gail Robertson serves as Assistant Professor of Tuba and Euphonium/Jazz at the University of Central Arkansas where she is tubist in the Pinnacle Brass and teaches the Jazz Ensemble II. She earned her B.A. degree from the University of Central Florida and a M.M. in Euphonium Performance from Indiana University while serving as graduate assistant to Harvey Phillips. She postponed her doctoral studies at the University of Maryland with Dr. Brian Bowman to perform with the “Tubafours” at Walt Disney World, Orlando where she served as musical supervisor/chief arranger and produced a highly acclaimed CD, “Tubas Under the Boardwalk.” She has recently completed her D.M.A. as a University distinguished Fellow at Michigan State University studying with Phil Sinder, Ava Ordman, and Ricardo Lorenz. She has taught on the faculties of Eastern Michigan University, the University of Central Florida, Bethune-Cookman University, the University of Florida, and remains active as a teacher, adjudicator, composer, arranger and free-lance artist, both nationally and internationally. 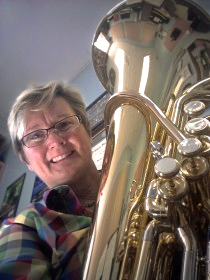 Robertson was recently elected Vice President/President Elect of the International Tuba and Euphonium Association (ITEA) and she will begin her six-year term on July 1, 2017. She is currently the Chair/Chief Editor of the International Tuba and Euphonium Press, and serves on the Board of Directors of the Leonard Falcone Tuba and Euphonium Festival, the ITEA, and the International Women’s Brass Conference (IWBC). She has served as President of the IWBC and as a conference host in 2010 and 2006. She has also served as Euphonium and Membership Coordinator of the ITEA and was the featured artist on the cover of the ITEA Journal (Vol. 38:1, Fall 2010). Two of Gail’s original works have also been featured Gems in the ITEA Journal (Jazz Encounter No. 1 – Gem Series No. 22, Vol. 38:1, Fall 2010, and Allegro et Andantango – Gem Series No. 33, Vol. 41:3, Spring 2014). Archer, T.O. Sterrett, and Phillip Bimstein. In 2007, Gail received Tau Beta Sigma’s highest honor, the “Outstanding Service to Music Award .” Gail has also been a clinician for the MIDWEST Band and Orchestra Clinic in Chicago, the Florida Music Educators Association, the Michigan Music Conference, and numerous ITEA, IWBC, and United States Army Tuba and Euphonium Conferences. Recently, In December 2016, Gail was District 6 jazz clinician/artist for Harrison School District. Dr. Robertson has acted as euphonium clinician for the American Band College (Ashland, OR) and Dixie Band Camp (Conway, AR). Bandworld , and the International Tuba Euphonium Association, ITEA Journal.